Far inland, the sun floats on the waves of a bake-earth day. Big Red and his mob of kangaroos wait for night-time when they can search for food. Young male kangaroos wait too - ready to challenge Red and take his place as leader. Claire Saxby was born in Melbourne and grew up in Newcastle, NSW where she thought she'd stay until the end of her days. Then, while she was holidaying in Melbourne, Claire's parents decided to move to Bougainville Island in Papua New Guinea. Fortunately, they waited and took her with them. Since then, she's lived in more houses than she can remember. Claire is the author of Ebi's Boat, illustrated by Anne Spudvilas, which was a Children's Book Council of Australia Notable book in 2007. Her title published with Walker Books Australia in 2010, There Was an Old Sailor, illustrated by Cassandra Allen was short-listed for the Speech Pathology Australia Book of the Year Awards 2010, Young Children Category. 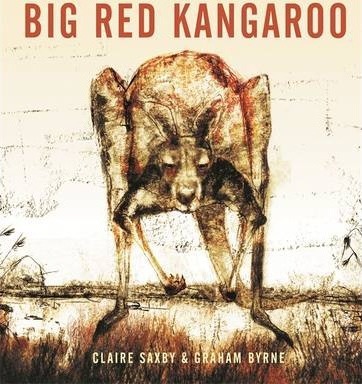 In 2014, Big Red Kangaroo was a CBCA Notable for the Eve Pownall Award for Information Books and short-listed for the Griffith University Children's Book Award, part of the Queensland Literary Awards. Born in Sydney sometime last century, Graham Byrne did the usual school and university time, worked as an electrical engineer for years, then went into building houses and structures. The old back injury put paid to hard physical work. An interest in art as a creative adjunct to the practical nature of building led to formal education, work installing artworks at the Museum of Contemporary Art in Sydney, and wonderings about other roads to explore. Wanting his art to have some "practical" useful purpose, to be illuminating, pointed Graham to illustration and design pathways. Explorations of drawing, painting, filling sketchbooks, making books for his grandchildren and illustrating short stories have combined to prompt his journey as a book illustrator. Big Red Kangaroo is Graham's first book. In 2014, it was a CBCA Notable for the Eve Pownall Award for Information Books and also short-listed for the Griffith University Children's Book Award (part of the Queensland Literary Awards) and the CBCA Crichton Award for New Illustrators.